The last few months have been quite tricky. My Dad has been unwell and we have had to miss and cancel certain events, days out and even a trip to France so at times things have felt quite miserable. However, reading back over my blog from the last year I realised just how many fantastic things we actually got to do in the last year. Hopefully we will be able to do more this year when he starts to get better again. This is a quick round up of my top three adventures from the 2016- all of which I really hope to be able to do again this year if I am lucky enough to get the chance. This is our absolute favourite family day out, and although we have been loads of times we never fail to have a fantastic time and are always looking forward to our next visit. Tucked away in the Vendee countryside in France you would never expect to find Vikings, Romans and wizards but that’s exactly what you get and much much more. We were annual pass holders last year and went several times during the Easter and Summer holidays- we saw all the amazing shows, visited the historical villages, experienced the WW1 trench, played in the water jets and got lost in the maze. I have blogged about this amazing place in much more detail before here. I would recommend anyone who finds themselves in that part of France to pay a visit, ideally for more than a day if you can as there is so much to do. Even better spend a night in one of their hotels and watch the amazing Cinescenie night show- this is what I would really love to do. We watched Cinescenie a couple of years ago and I would like to do that again but to stay in one of the hotels there too would be amazing! I think I will get my Dad into training and so he can do the Tough Mudder adult version! This is quite possibly the best way to raise money for charity ever! We have been to SportFest for the last two years and it is an absolutely fantastic way to spend a weekend for the whole family. You get to play sports and learn new ones with actual sporting legends. We had a whole weekend of amazing activities- a family run, a huge rugby game and a performance by the awesome RPJ band for the best concert. The food was great and the camping was fun. My highlight though was doing the conga across the cricket pitch led by Liverpool legend John Barnes! I would love to go back again, it was such an awesome weekend it would be very hard to beat. 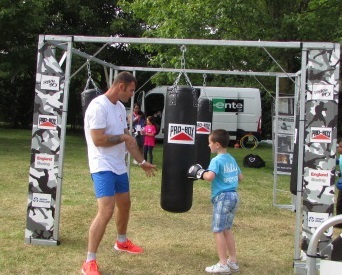 You can read all about our experience at SportFest here. We would all recommend this to any family (even my Mum who isn’t very sporty loves it). They even have a glamping option which looks awesome and very cosy and would mean you could get straight on with having fun. 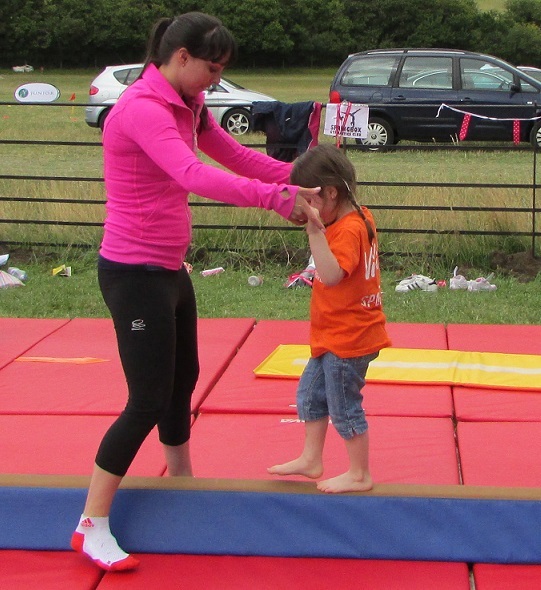 It seems like it was ages ago now but probably my favourite thing about our Summer holidays and the part of it that I have been writing about for my school work this week was going to SportFest. We heard about SportFest last year when our friends went so we were really excited when we found out Mum had won some tickets from Jeep UK. We knew it was going to be a really good weekend but hadn’t realised exactly how amazing it was! We traveled down on the Saturday morning and picked up our tickets and Lottie and I were given some cool SportFest T-shirts. We then quickly put our tent up and then went off to join the fun. There were lots of sports sessions for everyone to join in with and the groups moved around so you could try everything and then there were some extra sessions you could sign up for if you wanted to switch the normal sports for something different. from him, although the other football coaches were fantastic too. Over the two days we had an amazing time, I loved football, boxing and cricket but I think my favourite was hockey and I am actually going to start lessons this weekend now- yay! (Mum is very worried about my teeth after seeing how my Uncle’s are after years of playing hockey!) Lottie was too young for the proper groups but still got to try a few things including martial arts and the gymnastics and she now can’t wait until she is old enough to do gymnastics at school. It was such a great time to try new sports and learn new skills but it was also so much more than that. There was loads of other things going on- we got to do a driving simulator, which was awesome, there was a climbing wall which moved and was sloped- it was so much harder than it looked and there was lots of other activities to take part in. It was amazing seeing the I AM Invictus team playing sit down volleyball and the sporting legends playing a 15:15 cricket match in the evening. This was followed by a band who were really cool- we had an amazing time dancing until late and then went back to the tent to get some sleep ready for the next day. Baby Sam actually slept all night even though Mum and Dad weren’t sure if they were mad taking a 15 week old baby camping but he stayed warm and was perfectly happy and we woke up bright and early ready to go again. The food was delicious and was all included in our prize, it was made by Jamie Oliver’s restaurants and we got some really yummy things. There were also apples all round the grounds for snacks and then Jaffa were there giving away delicious oranges and fresh orange juice and Weetabix were doing things too so we definitely couldn’t have gone hungry! We also got to see the FA Cup and do a fitness test with Vitality which was quite funny (my Dad came out older than he really is and my Mum didn’t dare to do it!!) There was plenty of activities for grown ups too. It was such an amazing weekend, I really would love to go again and would definitely recommend it to anyone with children who enjoy being active- just hoping Mum can be lucky enough to win us tickets again for next year! I can’t believe the school holidays are nearly over. When we broke up from school seven weeks seemed like ages but by this time next week I will have finished my first day in Year 3 and Lottie will be getting ready to start school. Despite having no car for the first two weeks of the holidays, after breaking down on the way to Oxford, the time has gone really quickly. On the very first day we decorated some boxes, one for at home and one for out and about, and all put ideas inside them of things to do so if we dared to announce we were bored we could pull something out to get on with (my Mum insists on telling us that her Mum always said ‘Only boring people get bored- so Lottie has taken to announcing ‘I’m boring!’) and yet despite having loads of ideas we have hardly pulled any out to use, except baking and a cinema afternoon, as we have managed to fill the time with lots of other activities as well as just enjoying being at home with our toys and friends. We won tickets to SportFest (AMAZING- and well worth a post to itself!) spent two weeks in France, saw plenty of friends- although there is still a few more we would really like to catch up with, did lots of arts and crafts, visited the local museum, saw some theatre at the local park, celebrated Lottie’s birthday, entered a few competitions, read lots of books- completing the library reading challenge, watched a couple of films, spent lots of time outside and are now getting excited for Lottie’s party which is coming up next week. I have a feeling this last week will fly past- sadly we are now doing the final preparations for returning to school, I have got new school shoes and Lottie has her very first pair, we have got all her school uniform and I have been putting off trying mine back on which I now have to do first thing tomorrow as Mum thinks I have grown again! We have a friend coming to play tomorrow and it’s off to the dentist-yuk. On Wednesday Lottie’s friend is coming to play and his Mum will be helping ours to get ready for the big Frozen disco party- there are lots of books to wrap and sweets to put in bags as Mum doesn’t like party bag toys so each child is getting a book, piece of cake and some sweets but she always forgets how long it takes to wrap 30+ books! We also have to set up pass the parcel, draw an Olaf to ‘pin the nose’ on and Lottie and I want to make some snowflake decorations so I think we will be fairly busy with this.That just leaves a couple more days before it all starts again. I will be sad to be back at school and having to rush out the door in the morning. Mum will start rushing around and we won’t get to stay up as late at night and see as much of Dad, there will be homework to do, school reading every night and I will have to start music practice again properly but I am still looking forward to going back to school. I want to see my friends and start back at football. I am also starting playing table tennis at school this year and am finally going to be starting hockey outside of school, which I can’t wait for. I am looking forward to my little sister starting school too, although she is only just 4 and is a bit scared. We will have to make sure we really enjoy this last week… it’s not long until half term is it? !